The greatest mass movement of land animals witnessed anywhere in the world. Bird populations that number over 550 different species. The planet’s largest intact caldera. Tanzania is surely the land of superlatives. In Tarangire National Park, for example, you’ll be able to see one of the world’s greatest number of breeding species of birds in a single habitat. In the Ngorongoro Highlands you can explore the mighty Ngorongoro Crater – one of the Seven Natural Wonders of Africa – and on the Serengeti you have the drama, the thunderous noise and the sheer immensity of the wildebeest migration, together with the plethora of predators it attracts. Economy flights, full board at Kuro Tarangire, Entamanu, Serengeti Safari Camp and Lamari Serengeti, and half board at Machweo. Based on two people travelling. Flying into Kilimanjaro, via Doha, you will be met and privately transferred to your hotel just outside of Arusha. A truly tranquil hideaway, you’ll have time to unwind after your flight amidst the hotel’s lush gardens or by the pool. Today you will catch a scheduled light aircraft flight to your lodge in Tarangire National Park. Tucked away in a secluded patch of riverside bush, it’s the perfect base for discovering this vast wilderness which happens to support one of the greatest concentrations of wildlife outside of the Serengeti ecosystem. As well as lions and big herds of elephant and buffalo, you’ll have the opportunity to spot as many as 550 varieties of birds – the most breeding species in one habitat anywhere in the world – and rare dry-country antelopes such as the fringe-eared oryx and long-necked gerenuk. Guides will also drive you out into the park at night to spot some of the region’s more elusive, nocturnal species like porcupines and striped polecats. On day six you’ll board another light aircraft to Manyara from where you will be transferred by road to your lodge in the Ngorongoro Highlands. Spectacularly set on the very rim of the famous Ngorongoro Crater (the world’s largest intact caldera), you could not be better placed for exploring the area and its incredible density of game. You’ll also enjoy panoramic, far-reaching views across the crater and surrounding plains. Your safaris, led by expert guides, will bring you encounters with flamingos, rhinoceros, wildebeest, gazelle and a whole parade of predators including spotted hyena, lions and cheetah. In addition to game drives, you’ll have the opportunity to head out on foot alongside a Maasai scout in search of some of the crater’s smaller species and plants. You’re also likely to observe Maasai herdsmen grazing their cattle in the conservation area, and by visiting the nearby village you’ll be able to get a deeper insight into the local way of life. You fly out of Manyara to alight in the Serengeti. This is the country’s oldest and most prestigious national park and is wild Tanzania at its best. 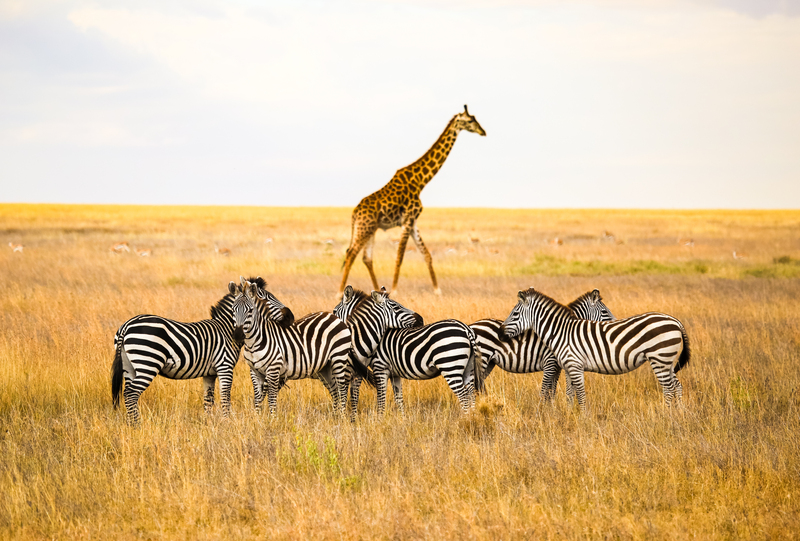 The mighty, million-strong migration of wildebeest – who are joined by hundreds of thousands of zebra and gazelle – is the region’s most awe-inspiring natural event. Your camp changes its location throughout the year in order to keep up with the movements of the migration, meaning you’ll always have an incredible view of the drama as it unfolds. Even out of the migration season the region supports huge numbers of big cats, elephants, giraffe, buffalo, eland, topi, hartebeest and impala. There are over 500 different species of birds on display – from ostriches to bizarre secretary birds and black eagles, as well as reptiles like agama lizards and smaller mammals like rock hyraxes. Your exploration of the mighty Serengeti continues now with a flight to Kogatende. Upon arrival, you will be taken to your lodge set amidst the rocks of the Kogakuria Kopje in the northern Serengeti. This area is bisected by the Mara River where, annually, over a million wildebeest and zebra charge across its crocodile-infested waters. The viewing from the banks is spectacular. Aside from the river crossings, this corner of the Serengeti is known for its lions, leopards and buffalo who are seen here in large numbers year-round. Say farewell to the Serengeti as a light aircraft flies you to Kilimanjaro Airport to meet your onward flight to Doha. From here you’ll depart on an international flight back to London.